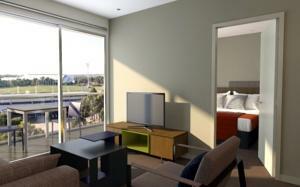 Quest at Sydney Olympic Park is a 2-minute walk from Sydney Olympic Park and a 5-minute walk from ANZ Stadium. It offers a fitness centre and guest rooms with flat-screen cable TV. The studio rooms have a kitchenette with a microwave, a fridge and a stove. The apartments boast a fully equipped modern kitchen, a lounge/dining area and laundry facilities. Sydney Olympic Park Quest is 2 km from Sydney Showground and a 15-minute walk from Olympic Park Station. It is a 30-minute drive from Sydney International Airport and the popular Circular Quay. Central Sydney is a 25-minute drive away. Rooms: Apartments: 140, Hotel Chain: Quest Serviced Apartments. Private parking is possible on site (reservation is needed) and costs AUD 20 per day. One child under 2 years is charged AUD 5 per person per night in a baby beds. One older child or adult is charged AUD 40 per person per night when using existing beds. There is no capacity for extra beds in the room. The maximum number of baby beds in a room is 1. Any type of extra bed or crib is upon request and needs to be confirmed by management. Supplements are not calculated automatically in the total costs and will have to be paid for separately when checking out.